The change in the weather will start Tuesday with more increasing cloudy weather and some showers in the French, western Swiss and western Italian Alps later in the day, with a rain/snow limit around 1800 meters. More widespread precipitation is expected across the Alps on Wednesday and Thursday, heaviest close to the Swiss-Italian and Italian-Austrian border regions. Snowfall totals from this upcoming storm will also be highly variable, but over 1m of new snow is possible by Friday at altitude close to the Swiss-Italian border. On Wednesday, temperatures start to drop in the western Alps as a cold front edges its way south into the region. I expect intensifying precipitation from the southwest on Wednesday with a large amount of rain and snow especially for the south side of the Alps. Parts of Switzerland are likely to see very heavy rain below 1800m Heavy snowfall is expected for the upper slopes south of the French Ecrins, the western and northern Piedmont, the area from Monte Rosa via the Gotthard to the Piz Bernina and later extending to the Ortler region and even to the south of the Austrian Otztal. A typical southwest dump. The snow line then fluctuates between 1500 and 1800 meters. 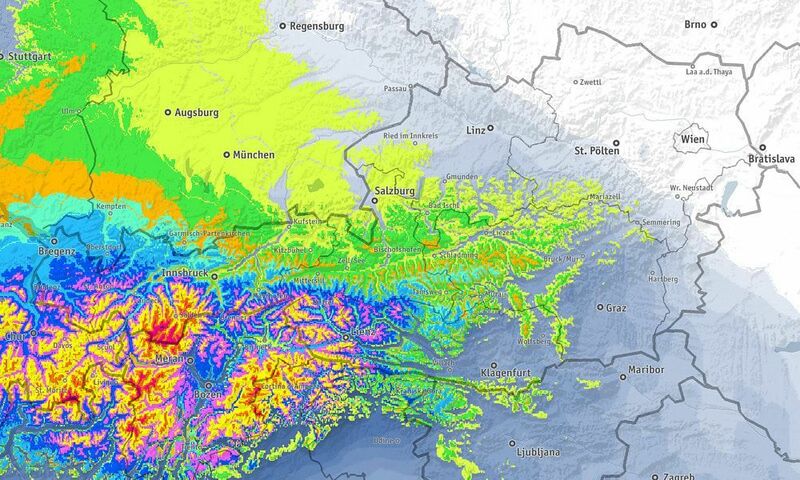 Lots of snow for the high alpine above 2000 meters in the aforementioned regions. With the invasion of the cold front, the current becomes west to northwest in the French Alps and the snow line drops, still southwest on the south side of the Alps with a snow line around 1500 meters and more and more west to north northwest in the Northern Alps with a snow line that drops to 1000 or even 800 meters during the course of Wednesday and Thursday. Then, on Thursday, it looks as though this chilly air will collide with a second low-pressure system moving up from the Mediterranean. The cold air flows further into the Alps. In the French Alps, with a north-westerly current, this still means snow for the French northern Alps. Cold and warm air come together above Monte Rosa / Haute Valais, the Gotthard / Sustenpass region and the south and center of Graubünden. The snow line will drop steeply and intense precipitation is coming up. Italy sees the snow front move very slowly to the east during the day. In the far west it gets better during the morning and in the western and southern Piedmont the sun comes through more and more often. It still snows heavily from the Aosta via the northern Piedmont and Lombardia to beyond the Ortler. The center of gravity shifts from northwestern Italy in the morning to northeastern Italy in the afternoon and evening. The Dolomites and Alpe di Giulia see most snow only towards the end of Thursday. The snow line is around 1400-1600 meters, but drops from the west to 1000 meters during the day. The greatest snowfall totals from this storm will be close the Swiss-Italian border, roughly to the east of Zermatt including resorts such as Saas-Fee, Cervinia, the Monte Rosa Region, the Aletsch Arena. By the end of Thursday some of these areas could see over 1m of new snow at altitude, with 1.5m in places, though it should be stressed that there won’t be anything like this amount at resort level. The central and south-eastern Swiss Alps (e.g. Andermatt, St Moritz) will also do very well, as will Italian resorts a little further east, such as Passo Tonale and the far south-west of Austria (e.g. Obergurgl). These areas could see 50-80cm of new snow at altitude by Thursday night. Even so, the snow will be widespread, and accompanied by wintry air. In France, for example they expect the daytime freezing point to drop to 1000m, and for snow to settle as low as 400m for a time on Thursday morning.